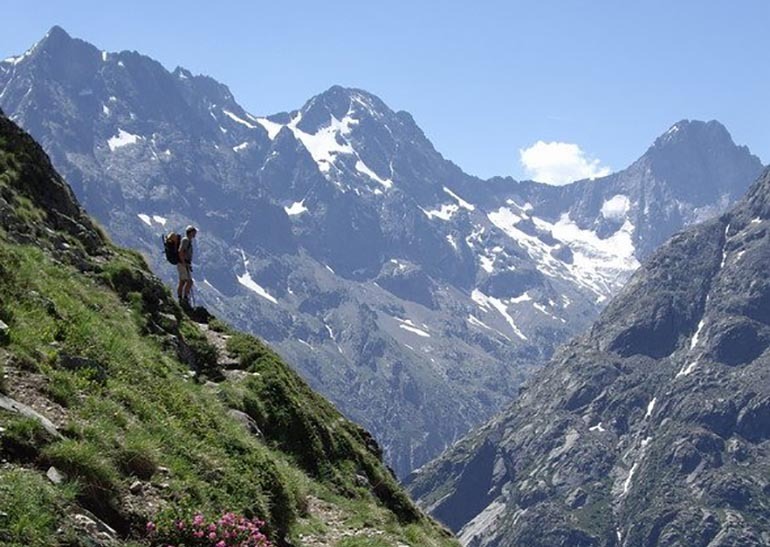 Spend a week exploring Nature in the French Alps and discover your innate strengths. then our Alpine Adventure Retreat in the heart of French Alps is just right for you. The Retreat will be led by author, accredited life coach, Tai Chi teacher and mountain lover – Dr Caroline Purkhardt. Summer is the season of full-on action. In the natural world, it is when plants flourish to their fullest potential, animals breed and the Sun stays up high above the horizon. Following Nature’s conduct, our human capacity for action also rises towards its peak. Our Alpine Adventure Retreat draws on this seasonal energy rise, as it is designed to reawaken your highest potential. Through various exciting activities out in Nature, you will be exploring what it means to face your true self and stay present in any situation. Ultimately, the Retreat is intended to boost your self-confidence and help you find out how to achieve the unachievable… with a child-like smile on your face! Via Ferrata – this exciting climb empowers you to face your fears and find the support you need. It is an experience of committing to something, no matter what, and finding your inner strength to do this. Bivouac out in the mountains – a true alpine adventure, which is all about simplicity. You will be leaving behind the comfort, as well as the complexities, of everyday life. Rafting – floating down a mountain river is a blast! This is an experience in which you can feel yourself one with the elements, fully present, joyful and bursting with excitement. Throughout the Retreat we will be using nature-based coaching as a means to uncover your innate strengths, natural limitations and habitual ways of dealing with the unknown. Nature-based coaching uses real experiences in the physical world (such as a challenging hike) to let you observe your various feelings, your habitual reactions and potential choices and then transpose these powerful insights into something immediately applicable in your ‘normal’ life. The Alpine Adventure Retreat is designed to deepen your self-awareness, as well as help you develop confidence and a sense of ease in the unknown whilst approaching new challenges. 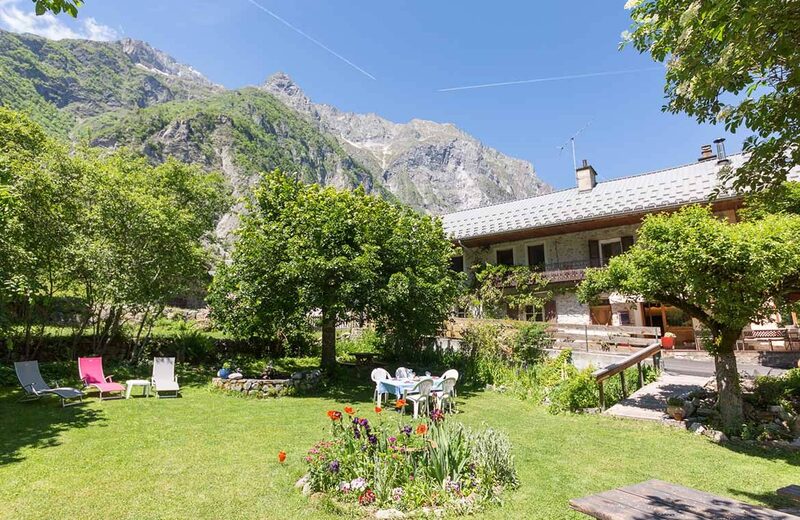 The natural surroundings of La Danchere and the Ecrins National Park create the ideal backdrop to being able to detach and relax as well as stretch yourself, revealing your hidden strengths and unique gifts. What to expect from the retreat? 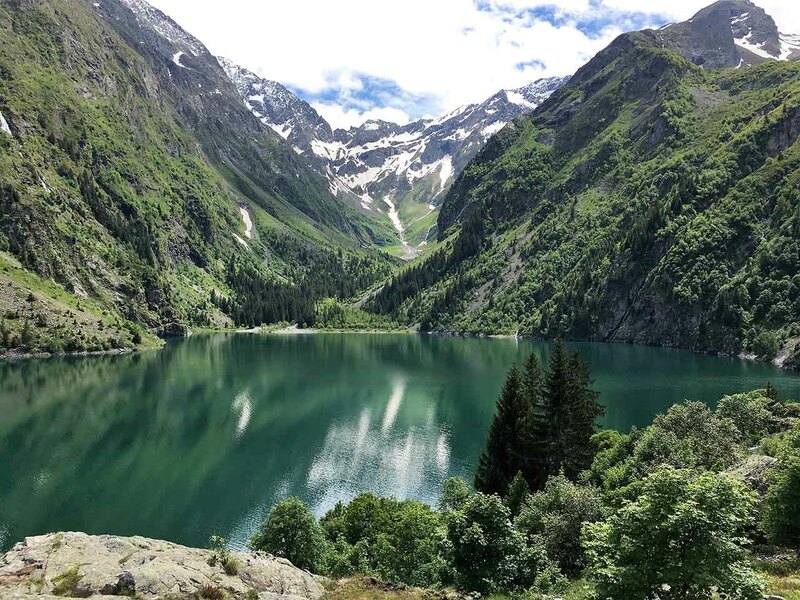 Most of the activities throughout the Retreat will take place outdoors, in the stunning and varied locations within the Oisans valley – including Lauvitel Lake, the Veneon River, the Belledonne or La Berarde. All the main adventures (Hike, Via Ferrata, Bivouac, Rafting) will be accompanied either by Caroline or a professional guide. 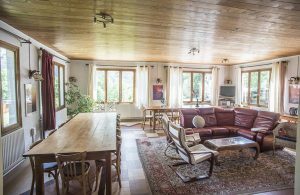 Lauvitel Lodge provides a comfortable and supportive base for relaxing, preparing and recovering from your mountain adventures, as well as additional activities. Each morning you will be invited to join the guided Moving Meditation (Tai Chi or Yoga) on the deck, and each evening it will be possible to share your experience of the day, gathered in the shaded gardens or on the sun drenched terrace. One of those evening sessions will be dedicated to creativity. This may involve painting, drawing, writing… or not. There are many different ways to be creative, and the point is to find your own. The Alpine Adventure Retreat is largely about being together and sharing your experiences with others. This gives everybody the opportunity to express their hopes, expectations, fears and beliefs, and really explore the impact of being out in nature. Our intention is to create a safe and supportive atmosphere, so that you can ‘live on the edge’ comfortably and try things that you would not normally imagine doing. Caroline Purkhardt has been running Lauvitel Lodge for over ten years now. During that time, she organised and led multiple group and personal retreats focused on personal development, creative leadership and spiritual growth. She has recently published a book called Stillness in Action, which is an actionable manual of her coaching methods. 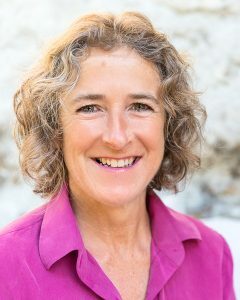 Having a PhD degree in Social Psychology, and at the same time being a certified Reiki Master, T’ai-Chi Kung Teacher and Life Coach, Caroline combines recent scientific findings with experiential practices of moving meditation and energy work. She believes that drawing on our connection with Nature is one of the best short-cuts towards self-realization. Caroline’s ultimate mission is to bring body wisdom and spiritual connection into busy workplaces and organisations. Each day during the Alpine Adventure Retreat will constitute of two major parts. First one is a Moving Meditation session on the Deck, serving as a conscious opening of our days. Every day the session will be a little different, so that it may set the ground for the particular outdoor activity planned later in the day. Second part of each day will be getting out and about to experience one of the Alpine Adventures (Lake Walk, Via Ferrata, Bivouac, Rafting) or, on one of the evenings, participating in the Creative Activity. We take care of all the logistics, so you don’t need to worry about transportation, additional fees or hiring a guide. The dinner and the time after is intended for socializing, self-time, rest and simply enjoying warm summer evenings. The program, although rich in activities, also leaves some free time for yourself. This is when you can go for a walk, exercise, read a book, journal or simply spend time with others in the garden. There is also an option of booking a massage or an additional private session with Caroline (Reiki, T’ai Chi or personal coaching session). Lodging in 2-person rooms. Single rooms are also available for an additional fee. Please contact us for availability. We will provide yoga mats, meditation pillows and blankets if needed. To check what else is available at the Lodge, please feel free to contact us directly.